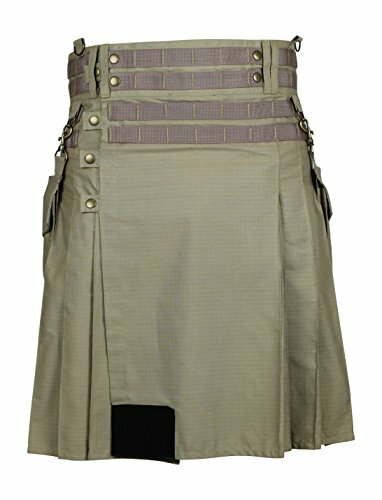 Our handmade kilts are built to last and will withstand any manly task you put them up to. Our Tactical model's additional features include two side zip trouser pockets, rear snap pocket, two removable cargo pockets, waist band D rings, and four Molle webbing loops circle the waist. The Molle webbing allows for fully customizable placement of additional utility; such as ammo packs, cargo pockets, or anything else you can hook on. All colors are constructed from lightweight rip-stop cotton fabric designed to hold up to the most demanding tasks while maintaining free-flowing comfort and mobility. Represent your team, clan or Country insignia on the front apron Velcro patch. Sizing Guidance: All sizes are 24'' in length. To pick a waist size please see the alternate product image for our recommended measurement methodology and then refer to the following sizing guide: X-Small ~ 31-32'' waist measurement, Small ~ 33-34'' waist measurement, Small-Medium ~ 35-36'' waist measurement, Medium ~ 37-38'' waist measurement, Medium-Large ~ 39-40'' waist measurement, Large ~ 41-42'' waist measurement, Large-XL ~ 43-44'' waist measurement and X-Large ~ 43-46'' waist measurement. Kilt sizing can be tricky even for the most experienced kilt wearer so no worries if you get it wrong on the first try, we'll work with you to make sure you're happy with your kilt's fit. YOUR KILT SIZE IS NOT YOUR PANT SIZE: Kilt sizing can be tricky but it ain't too tough if you take the time to do it, and do it right. Check out our sizing guide instruction images for everything you need to know to size it right the first time. Traditional style pleats, front apron with five snap closures at the waist, and three vertical snaps down apron closure. If you have any questions about this product by Damn Near Kilt 'Em, contact us by completing and submitting the form below. If you are looking for a specif part number, please include it with your message.